I found myself not enjoying my job like I used to. I was tired all the time and I just thought I was over worked and getting old. And then it happened-I diagnosed primary hyperparathyroidism in one of my patients last year and that lady taught me everything about parathyroid problems that I never knew! Parathyroid Surgery is Dangerous. I Don't Send My Patients If I Don't Have To. Of course I've diagnosed hyperparathyroidism a number of times in the past when my patients had really high calcium levels and kidney stones. That is what I thought about hyperparathyroidism-it isn't much of a problem until the patient gets a broken bone, a kidney stone, or their calcium goes above 12 mg/dl. I also knew that having a parathyroid operation was dangerous, therefore we avoided sending patients to have parathyroid surgery until they had one of those problems. Somehow we primary care doctors feel responsible when we send our patients to a surgeon and they have a complication during that surgery. I remember quite vividly a 55 year old mother of 4 that I sent for parathyroid surgery at our local hospital about 5 years ago. I sent her to the "best" surgeon at our hospital. That's what we do. Well she had a complication and her vocal cord nerve was cut during the parathyroid operation. Her voice was ruined and the stress that put on her life and marriage was terrible. Every time I see her in my office I feel partially responsible. It is a terrible feeling for a doctor to think they hurt somebody-I didn't hurt her, but I sent her to a surgeon that did. I love this lady, but hate seeing her on my schedule (it depresses me and angers me that this has happened). That is my background. I knew that parathyroid tumors were not cancerous, the operation was long and tedious, the complications of the operation (when they occurred) were terrible, and so I did nothing for my patients with high blood calcium until they had a kidney stone or broke their leg. That's what many of us family practice doctors do. We have all had those patients that did poorly after a parathyroid operation and we don't want any part of it. I'd rather they live with some high calcium than live without a voice and a huge, ugly scar. Five months ago I got a photograph of a large parathyroid tumor in the mail. Mrs Surrano was 61 years old and a recently retired school teacher. I've been treating her with anti-depressants and vitamin D for several years. I diagnosed her with "chronic fatigue syndrome" because of her fatigue, and of course vitamin D deficiency. Her calcium levels had been high normal or "slightly" high (between 10.0 and 10.9 mg/dl) for about 5 years. She came into the office this past Valentines Day and said she was reading about high calcium on the internet and that she was convinced that she had primary hyperparathyroidism. She asked (demanded actually!) for me to test the parathyroid hormone (PTH) level which returned at 86.8 pg/ml. At her next visit 2 weeks later, I explained to her that she had "mild" primary hyperparathyroidism and that we don't do much about that. I told her that this was not affecting her health and was not making her feel bad. I informed her that we could just give her a few months of high-dose Vitamin D to help fix these numbers. WOW did she get upset! It was clear that she had been reading and it was very clear that my patient knew more about hyperparathyroidism than I did. She refused her vitamin D prescription and left my office. 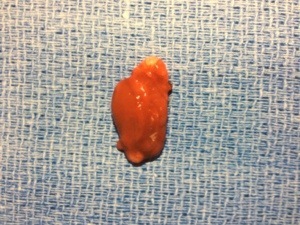 About 1 month later I get this photo of a parathyroid tumor in the mail. With it is a letter from Drs Norman and Lopez at the Norman Parathyroid Center. Their letter explained "how high the calcium has become is a very poor indicator of the severity of the parathyroid problem". Going on they said "adults don't feel good with calcium levels in the mid 10's, and that fatigue, memory loss, and aches / pains are the most common symptoms". Four weeks later Mrs Surrano arrives in my office showing me her tiny neck scar, waving her copy of the photo of her parathyroid tumor. She is so excited to tell me about her parathyroid operation, and how it has made her feel. She explains that her fatigue is GONE. Her memory is back. Her love of life is back! My office is full of unhappy, sick people, yet this lady is happy, excited, and loving life. Her labs are now normal with a calcium of 9.5 mg/dl. Could it be that my fatigue and loss of joy is from this same dumb parathyroid problem? My calcium is the same as hers! My calcium has run between 10.2 and 11.0 mg/dl for 5 years, but I have ignored it because I "knew it was nothing". Could I be that wrong? Like Mrs Surrano, I went online and filled out the forms to be evaluated by the group in Tampa and I faxed them all my labs. About 1 week later I got a call from Dr Jose Lopez, one of the 4 surgeons at the Norman Parathyroid Center. Jose and I laughed together about how I was watching myself be sick, only because I didn't try to learn more about primary hyperparathyroidism. He was fantastic on the phone and so amazingly knowledgeable. Two weeks later (September 3rd 2013) I found myself at the Parathyroid Center at Tampa General Hospital, where Dr Norman, Politz, Lopez, and Toro operate. On my day it was Drs Norman and Lopez. My scan was negative (funny how they like negative scans!) just like my two previous scans were back in New York. They don't care a bit, saying "did you come here for a scan, or did you come here to have your parathyroid tumor removed and be cured of hyperparathyroidism?". About 20 minutes later I was cured (16 minute operation by all the hospital records). I had one parathyroid adenoma and three normal glands (I have learned that you should demand that all four parathyroid glands are evaluated if you want to be cured). By 9:40 am I was on the hotel shuttle on my way back to one of the hotels that Dr Norman uses. One month after parathyroid surgery: This is how my life has changed. My Parathyroid ultrasound and sestamibi scan were negative . BUT I HAD A LARGE Parathyroid Adenoma. I learned first-hand what Dr Norman says all the time: "Scans are wrong more than they are right-stop getting scans!". I was there and watched them-they do the exact same 4-gland mini operation on people with positive and negative scans. I've learned that scans are over-used, over emphasized, and wrong more than they are right. I will never order another parathyroid scan! I used to feel very old already but not any more. I can't explain it, but I feel younger! In General: I feel more alert, more focused, Very energetic, very motivated to work. Mental Status: I don't feel depressed like I used to. I'm not anxious. I'm not tired or lazy. Sleep: My sleep medications are reduced by 80%. Face: My sunken cheeks have filled up. My wife says I LOOK younger and healthier. Eyes: I seem to open them much wider. Right eye, I am able to focus more. Ears: It seems I can now hear far away music volumes than before. I have lowered the TV by at least 60%. Nose: I can smell so much better now. Too bad, because now I have to clean all the bad smells in the house daily. Speech: Has become so much more stronger. I love it! I had been losing speech for last 3 years. Lungs: My breathing has become deeper again and Finally I can again meditate better, which I had been struggling for last 4 years. Blood Pressure: I have decreased my medication 20% in one month. Bones: No comments. I never had the bone aches that many parathyroid patients have. Joints: Shoulder and hip joints which were getting contracted are loosened up and flexed again and I feel very happy about this. Exercise: I'm in the Gym now regularly and use 20 to 40 lbs extra weight on other machines. My stamina has increased by 60%. Napping and Tiredness: I used to lie down in bed for a short nap several times per day, but not any more. Hyperparathyroidism Was Ruining My Life, And I Didn't Realize It! I have learned so much from my own patient. She made decisions about her own health without the help of her doctors (we were actually getting in her way and preventing her from getting better). She was cured of her parathyroid problem and it changed her life. She loved me enough to come back to my office to teach me about what she learned about hyperparathyroidism. She had lived it! Fortunately, I'm not one of those doctors that thinks he knows everything and I came to realize that I suffered from the same disease. I convey my hearty Thanks to Drs Norman and Lopez, and their staff. It is miracle for me to regain my youth in my old age! But mostly I thank my own patient Mrs Surrano. She cared enough about me to come back to my office to teach me. She saved my life! Sincerely, Ashok Goyal MD. New York. I bought the Calcium Pro App for my iPhone and iPad. It works equally fantastic on both, but sure LOOKS AMAZING on my iPad. If you don't have it, get it. Here are some more photos of parathyroid tumors. I didn't want one of these in my neck!